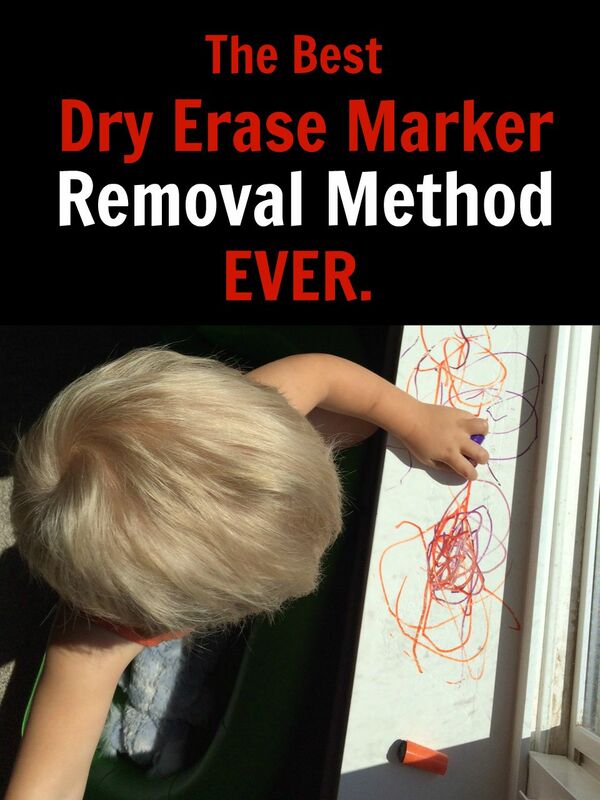 Lou Lou Girls > Amber > The Best Dry Erase Marker Removal Method EVER! So yeah, that happened yesterday. And the key to our car broke. And our AC stopped working. And I found water damage coming through our ceiling. And we discovered a missing gas line in our new house. AND (Shhh!) I’m pregnant and super super sick. It. Was. Crazy. Lucky for me, that day I also accidentally invented the best dry erase marker remover in the entire universe! Seriously. Before using my method I tried all the other things you find online. Rubbing alcohol, toothpaste, even just soap. Every method wasn’t really working and I was afraid with all the scrubbing I was going to remove the paint. Desperate, I grabbed my makeup remover wipes wondering if they’d do anything. Nothing. Since the rubbing alcohol had worked “the best” I decided to just buckle down and try some more with it. Since I had my makeup remover wipes in my hand I just dumped some of the rubbing alcohol onto it and started wiping. IT WIPED UP IMMEDIATELY!! It was amazing. I didn’t even have to scrub and it did nothing to the paint. Before while using the rubbing alcohol it left a sticky feeling after scrubbing, but that was gone too. I’m sure it was some mixture between chemicals in the makeup wipes and the alcohol and some smart person can figure it out, but whatever it was I was so happy!!! Please let me know if this helps you! 1. Dump some of the rubbing alcohol on the wipes and then gently rub the area. What a great idea. My daughter has a white board that is stained. I am going to see if this works.